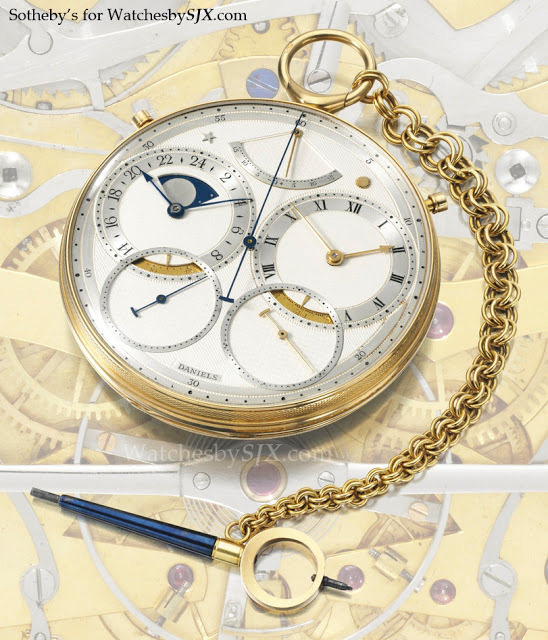 Top of the tables was the double escapement “space traveller’s” pocket watch with sidereal, mean solar time and chronograph which hammered for GBP1.33 million (about USD2.12 million). And the Daniels Millennium wristwatches sold for between GBP85,000 to GBP145,000, while the tourbillon with chronograph wristwatch hammered for GBP385,250. Especially notable amongst the non-Daniels brand timepieces were the wristwatches that Daniels modified to include his co-axial escapement. The Rolex Datejust went for GBP21,250, an Urban Jurgensen chronograph with an El Primero movement sold for GBP61,250, and the Omega Co-Axial limited edition serial number 000/999 hammered for GBP49,250. Though these prices are exceptional, they come right after Mr Daniels passing when awareness of his work is high. Such values will only be maintained if Mr Daniels continues to be remembered as one of the greatest watchmakers of the 20th century. Roger Smith is doing his part, and so is Omega, but that is not a certainty. There are plenty of great watchmaking talents who do not receive their share of recognition, the late Derek Pratt for example. See the full list of results on the Sotheby’s webpage.